Cardston, Alberta--(Newsfile Corp. - February 27, 2019) - American Creek Resources Ltd. (TSXV: AMK) (the "Company") is pleased to announce that JV partner Tudor Gold has updated information from the southern part of the Goldstorm Zone on the Treaty Creek property in the Golden Triangle region of British Columbia. New composites from drill holes completed during 2017 and 2018 demonstrate that significant horizons of stronger gold mineralization occur in a thick envelope of low-grade gold mineralization throughout the entire Goldstorm Zone. Within the low-grade mineralized body, near-surface horizons of stronger gold grades occur. 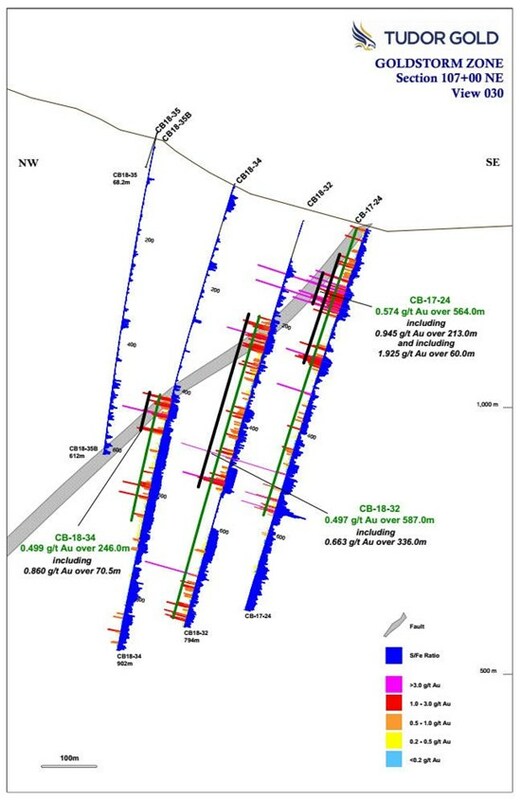 The southernmost drill section, 107+00 NE (attached below) demonstrates that the Goldstorm Zone contains a higher grade gold interval at its eastern near-surface projection in hole CB-17-24. This enriched gold interval averages 0.945 g/t Au over 213.0 metersincluding the core of the zone that averages 1.925 g/t Au over a 60 meter interval. Similarly, the upper part of the gold intercepts in holes CB18-32 and CB18-34 also demonstrate that the stronger gold mineralization occurs in the upper portion of each intercept. 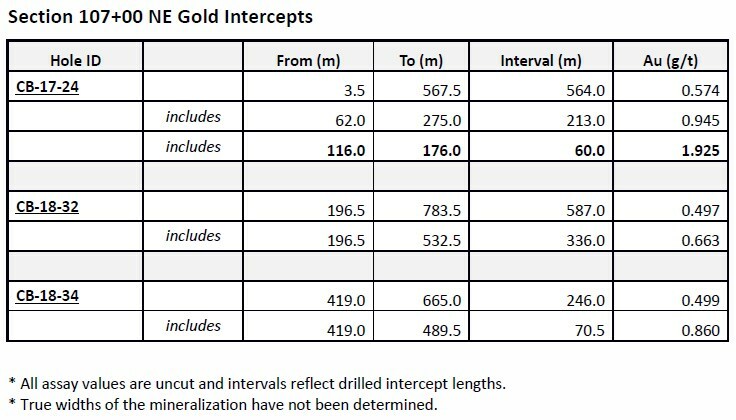 The following table gives gold composites from the three drill holes on Section 107+00 NE that cut the Goldstorm Zone. 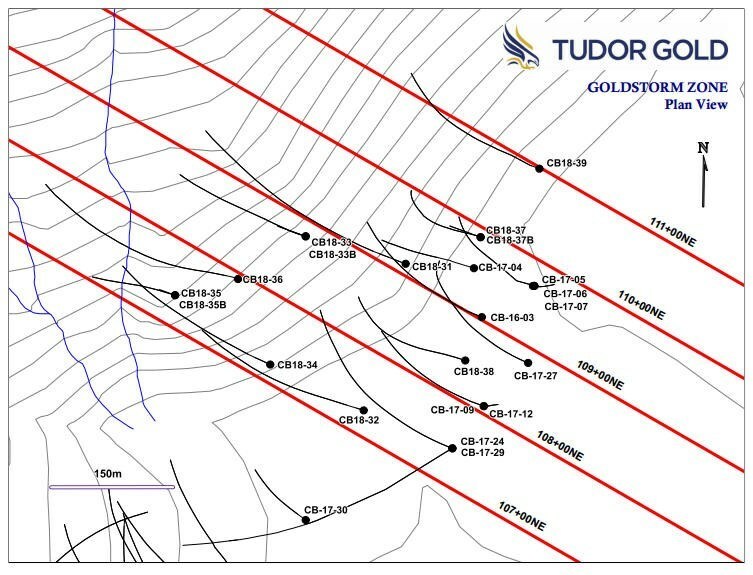 Tudor Gold Exploration Manager Ken Konkin stated: "We consistently see thick, low-grade gold intercepts that contain distinct horizons of stronger gold mineralization throughout the entire Goldstorm Zone. Our preliminary petrographic studies confirm that gold mineralization is associated with multiple pulses of disseminated and veinlet pyrite emplacement. These events were then over-printed and mineralized by late-stage, steep-angled, quartz-calcite-pyrite veinlets that contain native gold. The hanging wall of the Goldstorm Zone is well defined by a sharp fault contact. This appears to be a moderately dipping regional thrust fault similar to the orientation and nature of the Sulphurets Thrust Fault hanging wall contact at Seabridge's Iron Cap deposit, located five kilometers to the southwest." Goldstorm extends for at least 500 meters along a northeastern strike and is open to the east, north and down dip. A drill plan map showing the locations of drill hole collars and section lines is included below in the attached Section 107+00NE. Drill hole CB18-35B stopped within the fault zone and therefore did not penetrate the gold zone. In the following weeks, geologists will be planning an aggressive diamond drill hole program for the 2019 exploration season in order to fast-track the advancement of the Treaty Creek Project. Tudor Gold will be displaying core samples and drill sections at booth #3314 at the Prospectors and Developers Association of Canada convention in Toronto March 3-6, 2019. The Qualified Person for this new release for the purposes of National Instrument 43-101 is Tudor Gold's Exploration Manager, Ken Konkin, P.Geo. He has read and approved the scientific and technical information that forms the basis for the disclosure contained in this news release. American Creek holds a strong portfolio of gold and silver properties in British Columbia. Three of those properties are located in the prolific "Golden Triangle"; the Treaty Creek and Electrum joint venture projects with Tudor Gold (Walter Storm) as well as the 100% owned past producing Dunwell Mine.